Bow Fell is one of the greatest of the Lake District fells, presenting a proud face to Great Langdale and to Eskdale, and offering stunning views towards the Scafell range. Bow Fell plays a different role in the views from the two valleys. In the upper reaches of Great Langdale it is the dominant fell. From Eskdale it forms part of a wall of impressive fells that line the upper reaches of the valley, running from Scafell, over Scafell Pike to Esk Pike then Bow Fell and finally Crinkle Crags (although Eskdale also offers the most impressive profile of Bow Fell, with it forming a classic mountain pyramid). Bow Fell is 'L' shaped, with the summit at the corner of the L. The long ridge runs north towards Angle Tarn, while the short ridge heads east, with the cliffs of Bowfell Links on its southern edge and the Great Slab towards the eastern end. In most directions Bow Fell actually ends quite quickly, with high boundaries with Esk Pike, Crinkle Crags and Rossett Pike. Only in the east does it put a foot out towards a valley bottom. This is The Band, almost two miles long and the best approach from Great Langdale. The eastern face of Bow Fell is dominated by crags and cliffs and offers no safe walker's routes. The western face is more accessible - a path runs alongside Yeastyrigg Gill and the slopes above it are passable, at least once one gets past the summit. The two normal approach routes are from Ore Gap in the north of Three Tarns and the Band in the south. Ore Gap can be reached from Eskdale via Lingcove Beck and Yeastyrigg Gill, from Angle Tarn or via Esk Pike. Three Tarns can be approached from Eskdale along the same route as Ore Gap, branching off in the upper reaches of the valley, or along the Band, coming from Great Langdale. There is also a path that runs along Buscoe Sike and Oxendale Beck. Towards the top of the Band another path heads up the rocky eastern end of the main summit area, passing Flat Crags and the Great Slab. We have two walks on Bow Fell. The first starts in Eskdale and takes us over Esk Pike and Bow Fell before returning via Three Tarns. 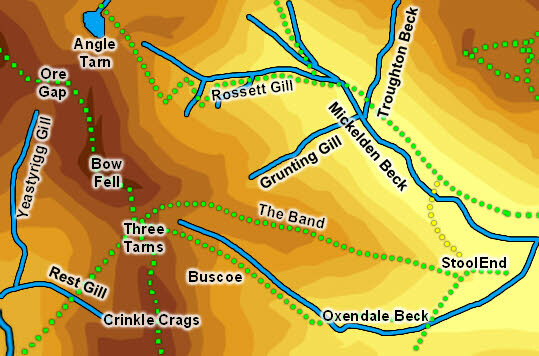 The second is the classic Band route from Great Langdale. The summit of Bow Fell is a rocky pyramid that sits on top of the wider 'L' shaped summit area, and that requires an easy clamber across boulders to reach the very top. This is a supreme viewpoint, with great views in every direction although it can be difficult to find a comfortable place to sit! The western boundary of the fell is formed by Yeastyrigg Gill, which flows between Bow Fell and the southern ridge of Esk Pike. To the south unnamed streams run west while Buscoe Sike flows east from Three Tarns, marking the boundary with Crinkle Crags. Buscoe Sike flows into Oxendale Beck, which marks the southern boundary of the Band. Mickleden Beck forms the northern boundary of the Band. To the north Rossett Gill forms a boundary with Rossett Pike. The far northern tip of the fell is marked by Angle Tarn which sits below the crags of Hanging Knotts. Angletarn Gill, which flows north out of the tam, can't really be claimed by Bow Fell. Grunting Gill flows north into Mickleden and Dry Gill runs south from the Band. Three Tarns, in the dip between Bow Fell and Crinkle Crags, contains a varying number of small tarns, with tarns drying out or merging depending on the weather. One of the most unusual features of Bow Fell is the Great Slab, a smooth rock face that unusually sits nearer to the horizontal than the vertical, and that can be found close to the path up from Three Tarns.